It’s been a while since I’ve tried a new Unit Testing framework. It seemed that between NUnit, XUnit & MSTest I had enough to choose from. I’ve always tried to be pragmatic when choosing a test framework for a new project and when suggesting one to a new client. Although all .NET unit testing framework are pretty similar there are some differences between them – and I’m not talking about how they call the “Test” attribute. One of the features I missed the most was Parameterized unit tests – the ability to write a test once and run it several times with the same input. Since MSTest is widely used it was frustrating to see good developers write bad tests just because that featured was missing. That’s why I was happy to find out that not only is Microsoft working on a new “MSTest V2” but it will have the parameterized tests I’ve always wanted. On top of that getting started with it is simple. 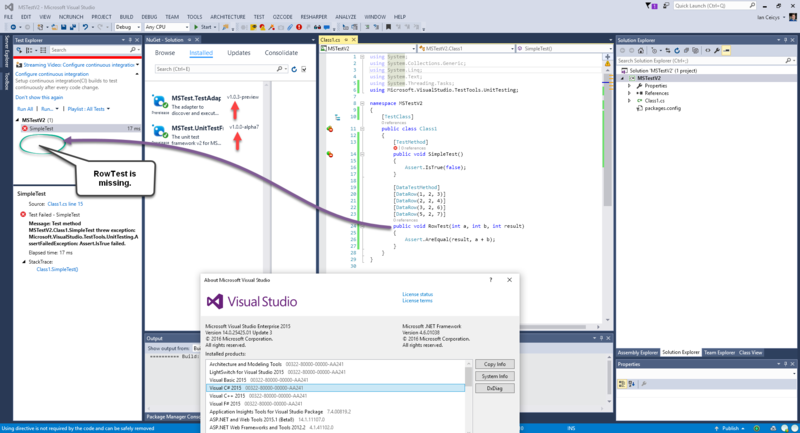 You no longer have the create a special “Unit Testing” project – any class library will do. And it works! I run the tests and from each row runs as a separate test. At the moment there is no way to run only one row – you have to run them all. This means that I cannot debug a single row – which can become very painful with multiple rows. Although NUnit (and XUnit) still have better row testing functionality at least now I can write (and teach how to write) proper tests even when a client has chosen to use MSTest (due to other good reasons). So it looks like Microsoft has changed how DataTestMethod work in the latest MSTest V2 updates.